Every so often, a dish becomes such a hit, it’s practically synonymous with an eatery. 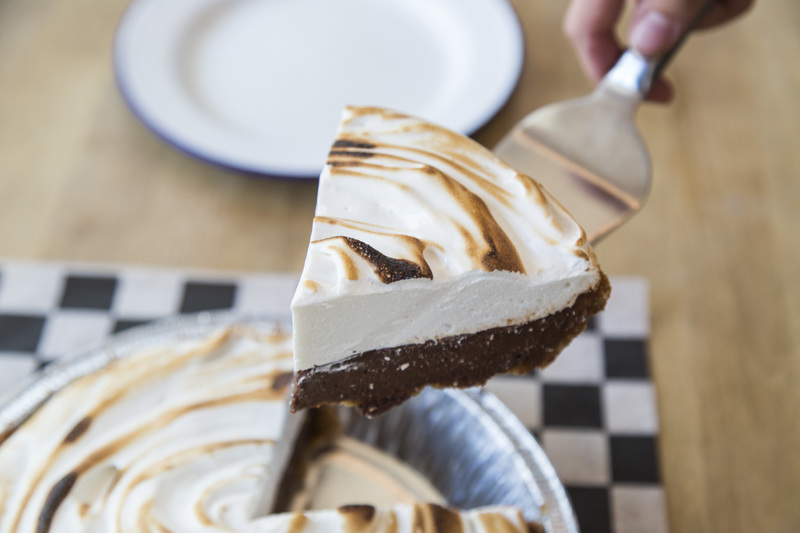 Such is the case with this pie from Liz Prueitt and Chad Robertson’s award-winning Tartine Bakery. 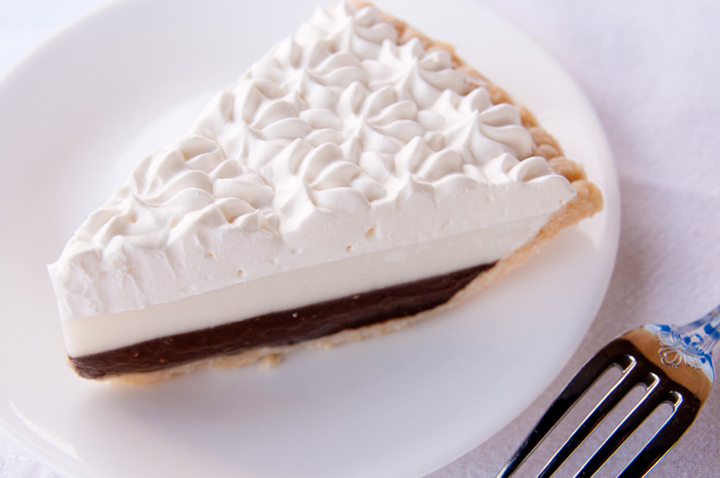 A smear of bittersweet chocolate acts as a barrier between filling and shell, ensuring a flaky crust with every bite and balancing out the sweetness of the banana-studded pastry cream. Chocolate shavings finish the delightfully messy confection. 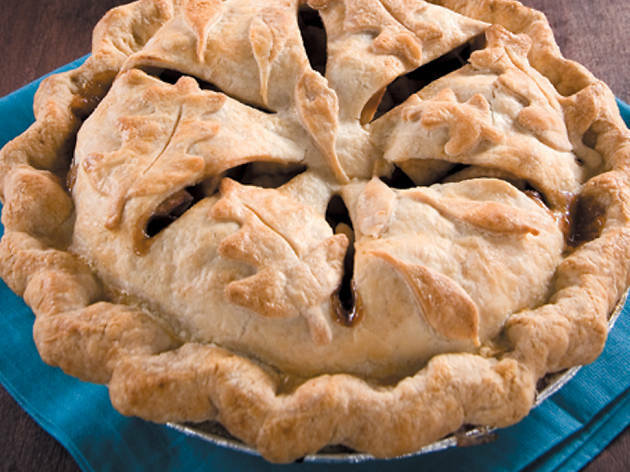 This ain’t your grandma’s apple pie. Speckled with vanilla sugar salt, the golden crust of Random Order’s bestseller encases a mix of organic Granny Smiths and Pink Ladys folded with house-made caramel—owner Tracy Olsen’s decadent tribute to the candy apple. 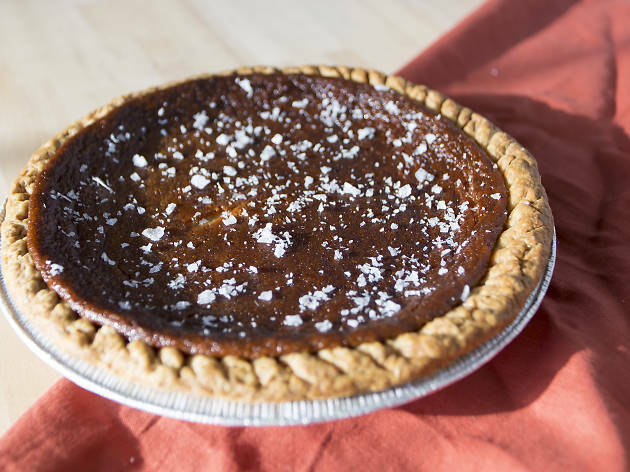 While the accents are anything but traditional, the crust is as classic as they come: the butter-studded dough gets rolled out by hand into a reusable glass dish for every pie. 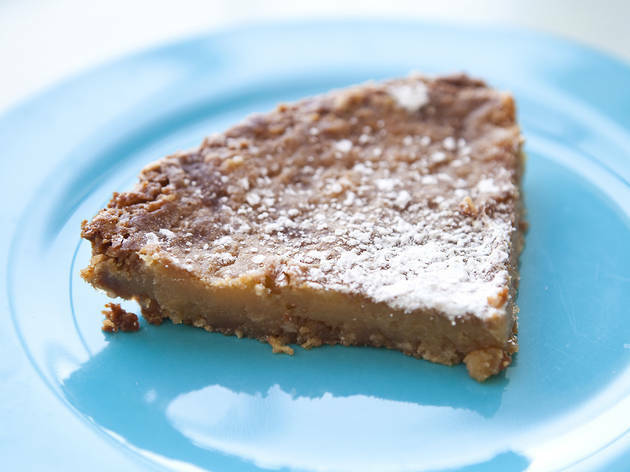 Crack pie from Momofuku Milk Bar, New York City and Washington D.C.
Naming your pie after crack is a bold statement, but it’s fitting for the addictive properties at play in Christina Tosi’s legendary salty-sweet creation from Momofuku Milk Bar. A giant crumbled oat cookie subs in for your standard-issue crust, which is draped in a gooey butter filling shot with vanilla and—surprise ingredient—corn powder. 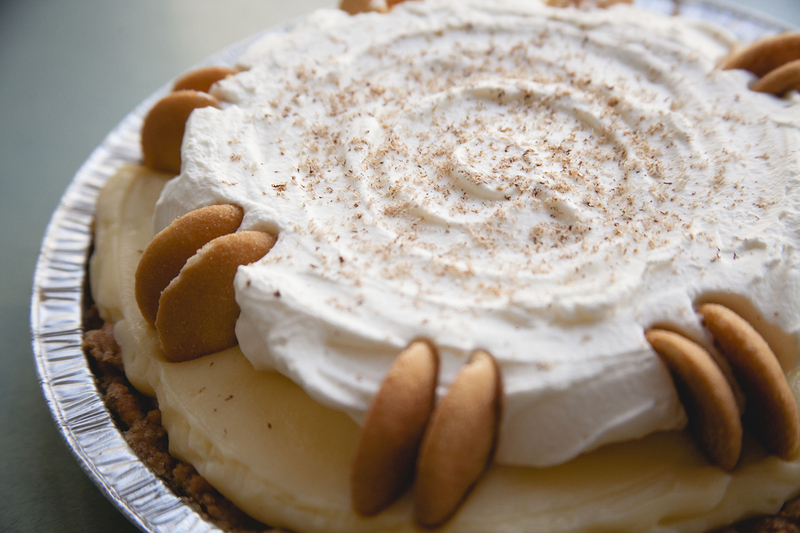 Cozy diner Honeypie Cafe proudly reps its Midwestern roots with gussied-up comfort food and desserts. 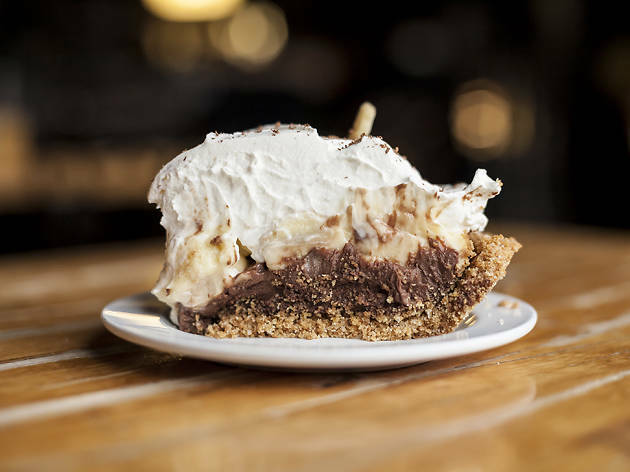 To form her luscious homage to old-fashioned black-bottomed pies, baking guru Valeri Lucks marries two of her bestsellers, layering chocolate and banana custards—both made with Wisconsin milk—atop a crisp graham cracker crust. 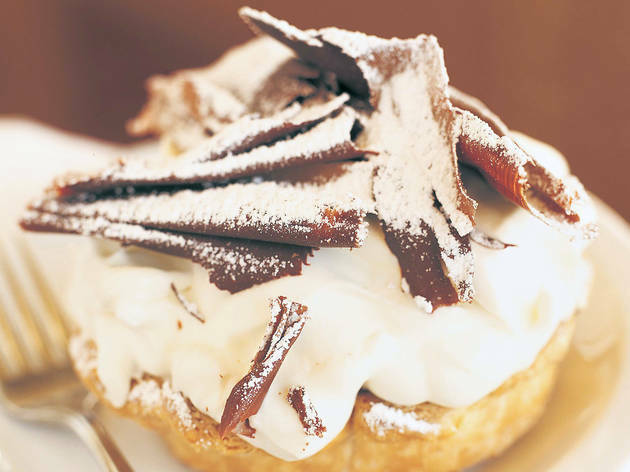 She crowns the glorious affair with a mound of fresh whipped cream, which every pie-lover knows is an essential addition. 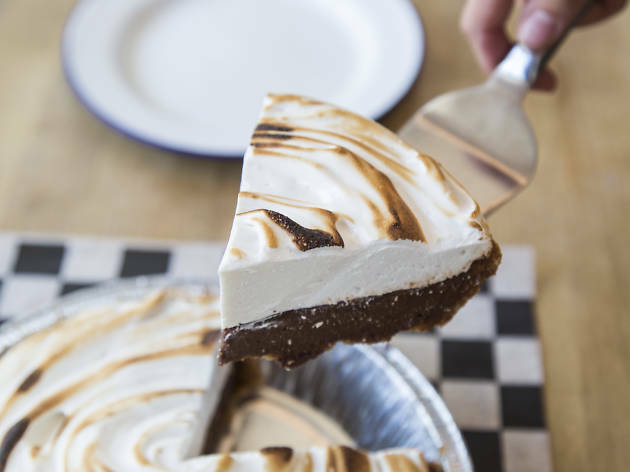 Former fine-dining pastry chef Paula Haney made a name for her pies at farmers’ markets and coffee shops, before opening a tiny, retro pie shop in West Town to sell her seasonal creations. 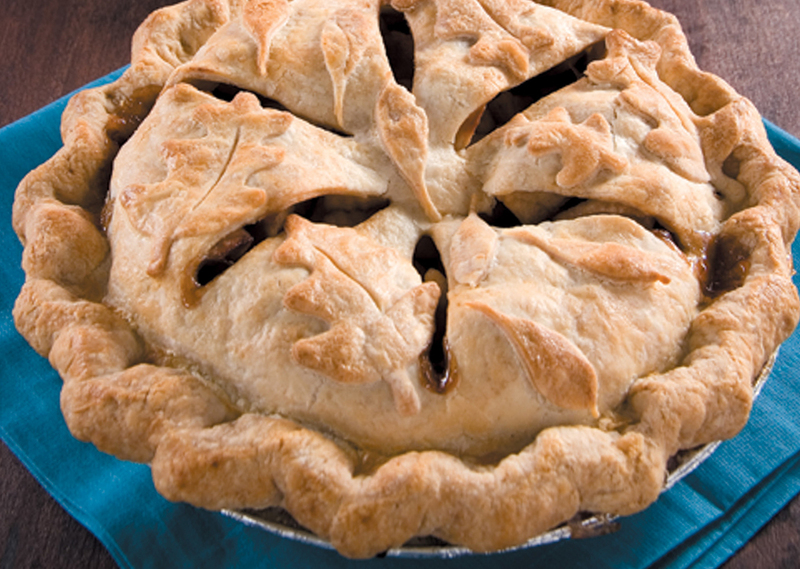 Come fall, the apple pie at Hoosier Mama is a must-try—the classic is expertly done here, with nicely sliced apples and perfectly flaky crust. It’s a welcome addition to the holiday table. 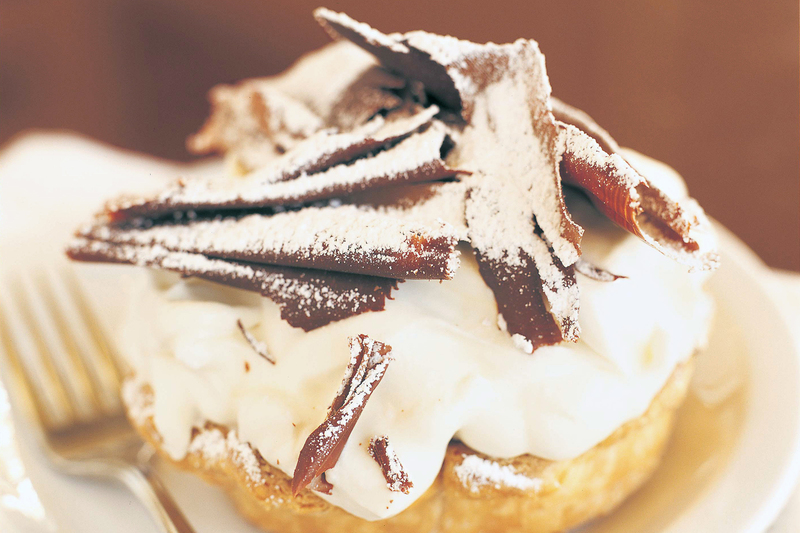 Photograph: Courtesy Achatz Handmade Pie Co.
Years before Grant Achatz became a food-world luminary, second cousins Dave and Wendy were building a pastry empire in the family’s native Michigan. 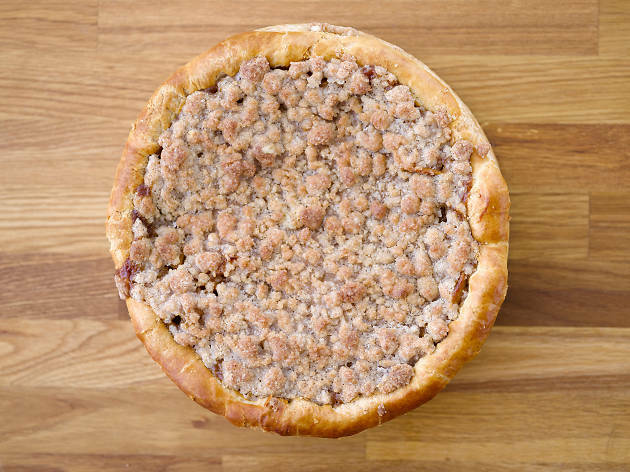 The self-taught bakers shot to pie-slinging fame with this streusel-topped beauty, available at Achatz Handmade Pie Co. Sweetened with just a touch of sugar, the delightfully tart filling allows the plump, locally-grown blueberries, blackberries, raspberries and cherries to shine. Oahu’s top pie purveyor sits on the island’s North Shore, home to some of the Aloha State’s most epic waves. Just as legendary as the surf is this laidback gem’s custard two-fer, a menu staple since Ted’s opened in 1987. 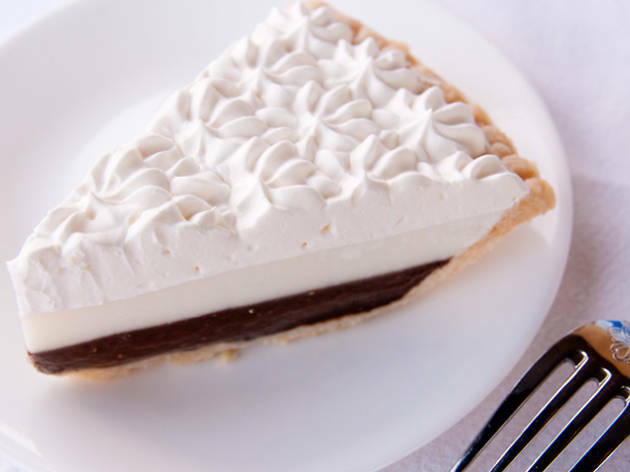 A velvety layer of haupia (coconut) pudding infuses touch of tropical flair into the unconventional chocolate-cream pie. 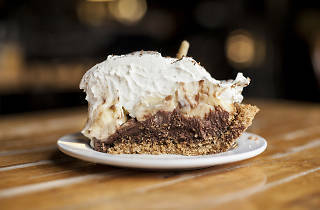 It’s the best of both Thanksgiving worlds at Outer Sunset gem Devil’s Teeth, where baker Hilary Passman fuses two holiday favorites into one craveworthy pie. 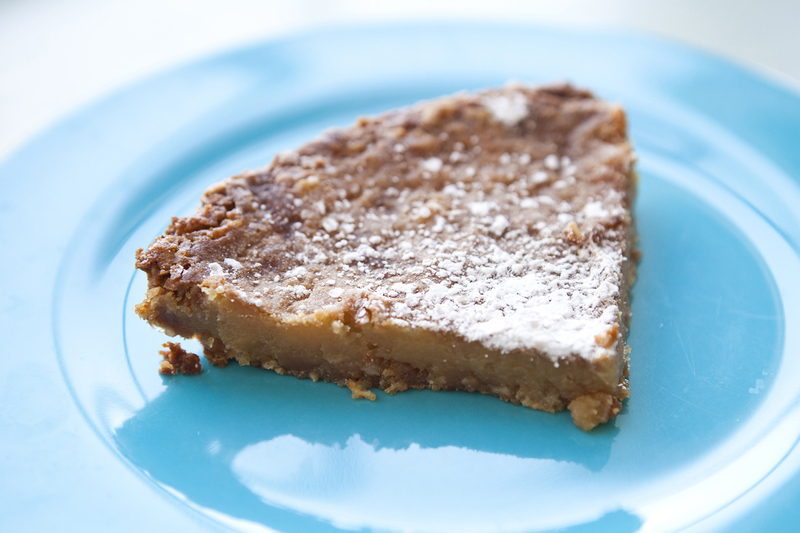 A rich layer of sweet potato filling sits on the bottom, cloaked with a pecan-dotted custard. 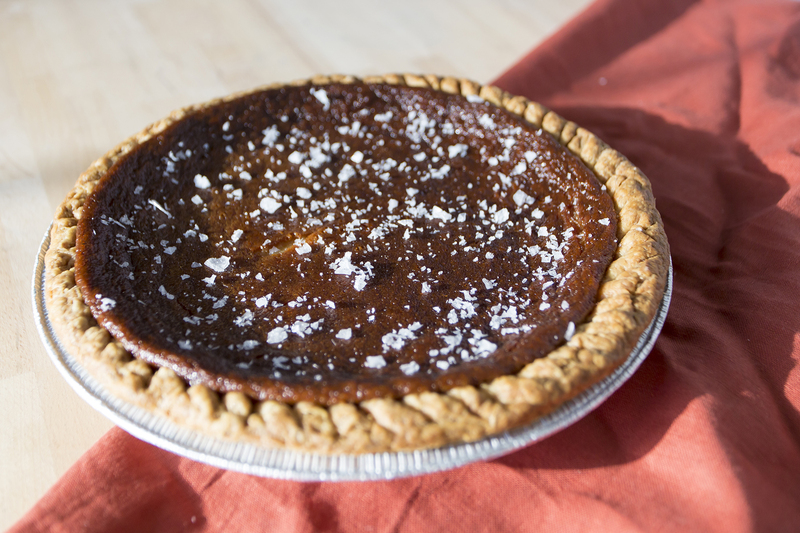 Pro tip: If you order a whole pie for Thanksgiving, there’s an optional whiskey butter sauce. Williamsburg’s cult-status Southern chicken-and-pie joint Pies and Thighs does right by this old-fashioned granny staple. 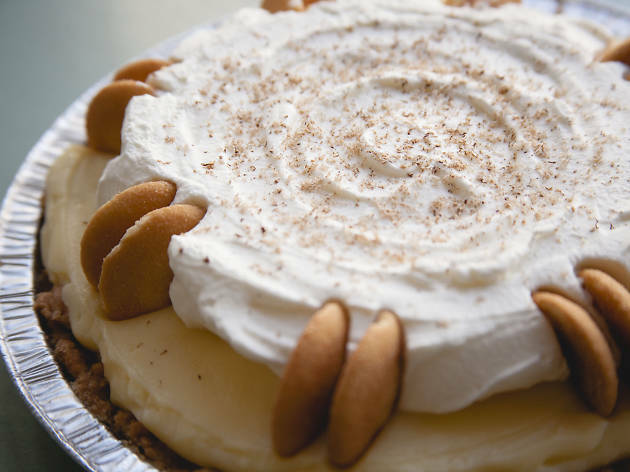 A banana-cream base nestles chunks of fresh bananas in a Nilla wafer crust, topped with whipped cream, a dusting of spicy nutmeg and whole Nilla wafers. With its “go big or go home” mentality, it’s no surprise that the Lone Star State serves as the birthplace of this deep-dish behemoth. 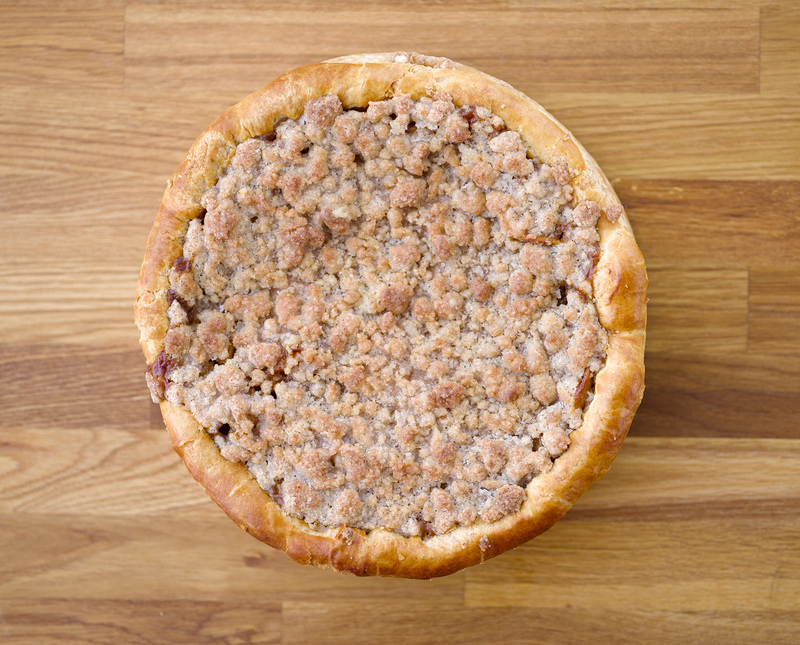 Towering over most others, the aptly named Lord of the Pies calls for a whopping 10 whole Granny Smith apples, the fruit’s tart punch tempered by Emporium Pie’s rich house-made caramel and a generous heap of cinnamon crumb topping. A tender, all-butter crust completes the Texan showstopper. We’re not sure exactly when Chicago became so pie-crazed, but we don’t care. 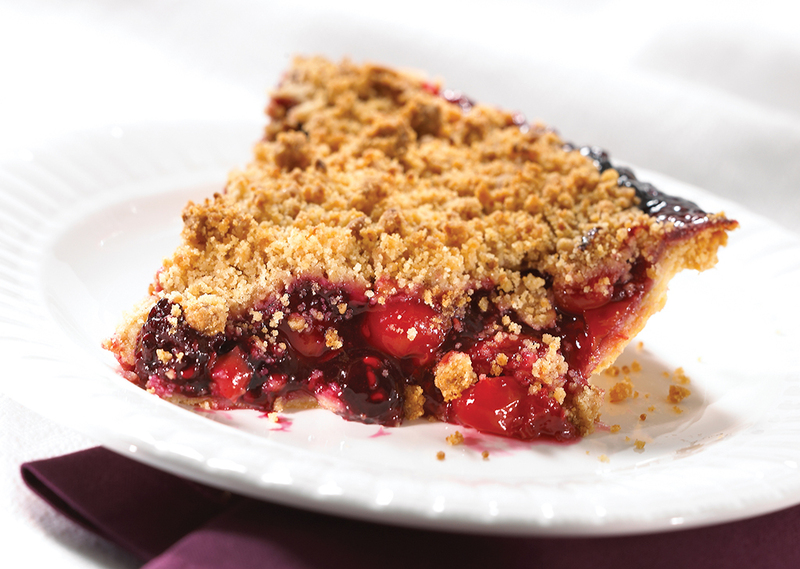 The city is a pie-lover’s dream.